Greece is the ‘mother’ of Western thought and is part of the European Union. Its thousand-year-old history and its geographical structure make it interesting from many points of view. From the motorcycle perspective this country is among the most loved by travellers and is often the destination of the ‘first trip abroad’ of many European bikers. Even if it is the 12th state in the world for length of the coastline, Greece is 80% made up of hills and mountains… some of which almost reach 3,000m (like Mount Olympus). Even the Aegean Islands are often the peaks of underwater mountain ranges. But there are also great plains and then forests, canyons, lakes, rivers and impressive rock formations. Basically the perfect territory to discover on the saddle of a motorcycle. ALONE OR WITH OTHERS? It depends on your experience in the saddle and of travelling. There are no contraindications about travelling alone, as a couple, with a group of friends or maybe following an all-inclusive tour. If you expect to do some off road, the support of a local guide could come in handy. Following is a short guide of the territory. ISLANDS – Around 6,000 if we include the isolated small islands dispersed in the Aegean and Ionian Seas. The inhabited ones are just 227, some of which deserve some days to be visited. Most of them are in the Aegean Sea and are divided into seven groups. MAIN CITIES – Athens and Thessaloniki are big lively cities, modern and at the same time full of multi-ethnic history. PELOPONNESUS – Monuments of all eras, great archaeological sites, such as ancient Olympia, Epidaurus, Mycenae and Tiryns, the Temple of Apollo Epikourios, and then Bizantine churches, fascinating hamlets and castles, mountains, forests, rivers and caves. The icing on the cake is the sea that surrounds the peninsula, with beautiful sandy beaches West and rocky ones East. EPIRUS – Region shared with Albania, between the Pindus range and the Ionian sea. Its mountainous mass offers virgin forests and the legendary Dragon lakes, natural scenery shared harmoniously with archaeological sites (such as the Dodoni theatre), monasteries, traditional villages (look for Zagorochoria). In the vicinity you can reach the Vikos canyon, the second deepest in the world, with an ecosystem of 1,700 plants and 182 animals. THESSALY – A lot to see. Mountains, rivers, beaches, lake Plastiras, the Valley of the Temples, the incredible Meteors, the most breathtaking and photogenic orthodox monastic complex of Europe. THRACE – a land to explore at leisure, where Nature is king. The rivers Evros, Nestos and Ardas, lakes Vistonida and Ismarida; Dadia forest and the delta of the river Evros, the endless expanses of white-sand beaches. CENTRAL GREECE – not to be missed is the archaeological site of Delphi and the Oracle of the god Apollo; the picturesque sea towns (such as Galaxidi, Itea, Nafpaktos). Those who love adventure will find thrills riding in the heart of Greek nature: ravines, impressive waterfalls, rivers with rapids, mount Parnassus. ATTICA – It is the peninsula of the Aegean Sea that hosts the capital Athens, with its extraordinary Acropolis and, scattered along the whole basin, significant places like Sounion and the Temple of Poseidon. The list of things to see is incredibly long but by bike it is possible to include many of them along a well-thought itinerary that ends at the Piraeus, the biggest and most important port in Greece. Here you will be able to board the ferries for the islands. Greece is part of the European Union and is part of the Schengen Agreement. Consequently citizens of the EU can enter the country with their passport or ID card valid for foreign travel. Visa is not required for owners of valid ‘non-EU’ country passports who intend to visit Greece and stay in the country for a maximum of 3 months (90 days) in a 6-month time frame. We remind you it is good practice to carry with you a copy of your personal and bike documents. Citizens of states members of the European Union in Greece can use their national driver’s licence; citizens from other countries must present an international driver’s licence, along with their valid national one. Bike tourers who enter Greece with their vehicle can use it privately without declaring it at customs and registration for 6 months, continuous or distributed over a year. This duration can be prolonged for further 9 months, with the premise that the bike or scooter be used privately. The Green Card, issued by your insurance company and without which it would be impossible to travel in many countries, is not required if your country has stipulated bilateral agreements with Greece. It is anyhow advisable to have it always with you. The road network in Greece is vast and constantly expanded and modernised. Those who choose to cross the country with their vehicle will not find any particular problems. Border crossings to enter Greece from the bordering Balkan states are Exochi for Bulgaria, Evzones Kilkis for Macedonia, Kakavia for Albania and Kipoi Evrou for Turkey. Igoumenitsa-Alexandroupoli (Egnatia Odos motorway); Canea-Agios Nikolaos (Crete E 75). The constant change of the Greek road network is connected to some advice you must absolutely follow: do not trust old maps. If you do not like using sat navs buy a recent map of Greece once there. If your route includes off-road itineraries in the region of Thrace… especially in proximity of the border areas with Bulgaria (Rhodope mountains) and Turkey (Alaxandroupoli, the Evros delta and the Orestiada area) you must know that you need special permits. In case you park in no parking areas, the Police, besides giving you a fine, sometimes also confiscate the licence plates. You can collect them only after paying the fine and showing the ticket which indicates the date you will leave the country. In case you get fined we recommend you not to sign any Police papers written in Greek if you are not able to understand them. In practice you need to insist on having the assistance of a translator, in accordance with local legislation. If you plan on hiring a bike or scooter, especially on the Greek Islands, you must be very careful. We remind you that the use of a helmet is compulsory in the whole country. Always make sure the insurance policy of the hired vehicle adequately covers damage to third parties, passengers, theft and damage to the vehicle (fire and vandalism). We recommend you ask to undersign the rental contract also in English. Avoid, especially in Athens, leaving you bike in unattended car parks by night. Never let your guard down on the islands: here too motorcycles get stolen. In the unfortunate event of involvement in a road accident, remember to take pictures of the vehicle’s damaged parts for insurance claims. In the case of problems with the local Police Authorities (being held in custody or arrested) we recommend you inform your Embassy or Consulate. Generally the degree of safety is in line with the rest of Europe, including the possibility of terrorist attacks. Language: Modern Greek; English and to a lesser extent French and Italian are spoken. Currency: Euro. Main credit cards are accepted. Cash machines to withdraw money are common. The electric network: in Greece it’s 230V AC (50Hz). North American electronic devices may require a transformer while British ones the classic adaptor to plug them in. Telephone: The area code for Greece is +30 (following is the local number that usually begins with the number 2, or 6 if you are calling a mobile phone). Consulate: Odos Patriarchou Ioakim, (Kolonaki) , 38 – 3rd floor. Phone number: 0030 2109538 180 – Mobile phone: 00306932204060 (active for emergencies only). There are almost 20 Italian consulates (between honorary consulates and consular agencies) distributed over the country. Public health facilities are crowded during summer and generally barely adequate on the islands. For the most serious cases specialised doctors and equipment are often missing. Consequently, before leaving, it is advisable to stipulate a medical insurance covering medical expenses and the possible medical repatriation or transfer to another country. Chemists are plenty and present over the whole territory, but work on shifts. No endemic illnesses are signalled in Greece. Following the appearance of the West Nile Virus – transmitted via infected mosquito bites (numerous cases have been reported the previous years especially in the regions of North Greece, Macedonia, Thessaly and Attica), the Greek Health Minister has intensified both prevention programmes and coordination with local health structures. In the last years cases of autochthonous malaria have been registered (Southern Peloponnesus, Attica, Thessaly). Malaria is an infective illness transmitted by the bite of the Anopheles mosquito. Consequently we recommend adopting adequate protections with repellent sprays and clothing that covers arms and legs, especially at sunrise and sunset, during spring and summer. Citizens of member states of the European Union can receive necessary medical treatment provided by the local public health service if in possession of the European Health Insurance Card (EHIC). Greece is a rather easy destination. 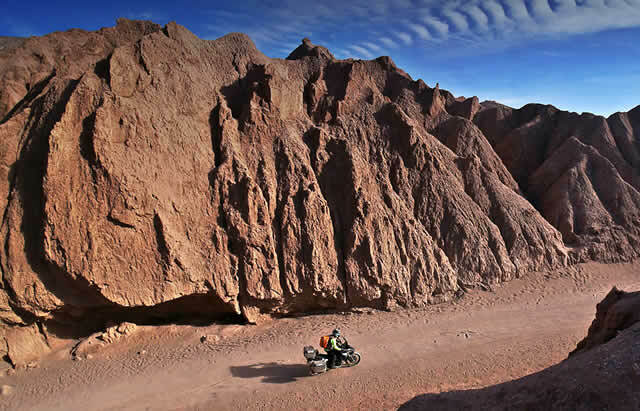 The country can be visited in the saddle of any kind of bike and easily also on a maxiscooter. In the period between June and September temperatures allow to travel light, starting from technical apparel, which must protect but also ventilate. A jet helmet can be tempting, but it is always best to choose a full-face, possibly openable. A convenient backpack can be an alternative to a tank bag. If you have no room for luggage use both. Talking of accessories, the classic set with side cases supported by a capacious top bag (convenient for trips to the beach) is more than enough. Always useful are the first aid and puncture kits, USB cables and smartphone holders. You can’t do without a high-quality mechanical lock and also locks with steel cable to secure the helmets to the bike during short stops. Off-roaders will find in the new GIVI catalogue a great number of accessories dedicated to maxi Enduros. A litre of 4-star petrol cost 1.57 euros in Greece (price on 23rd January 2017). Greece is indicated as a nation with a Mediterranean climate. This generally means mild temperatures, many sunny days and little rain the year round. Still, its geographical structure creates differences due to the influence of the continental climate of the North-East of the country (warmer summers and colder winters). In the whole area between land and the sea there are great variations. In the plains winters are mild while the mountains are always covered in snow. The same region can basically present different climate conditions in the same period. Mediterranean climate along the coast and on the islands, with warm dry summers and mild wet winters. Temperate climate in the country’s central area, in Macedonia and Thrace, with warm dry summers and cold winters. The advisable period to go on a bike trip is between April and October. One more thing: free camping is prohibited in the whole country. Greek bike rental company in business since 1976. With them it is possible to participate in organised tours, also for a single day, with English-speaking guide. Among their proposals there are also some adventure multi-day tours. Prices go from 40 to 132 euros a day (for a 7-day-minimum rental). Present in Greece with various rental shops, among which all main airports. The team has been active for some time in Bulgaria with very interesting offers for bike trips. The experience they acquired has allowed them to broaden their operational horizons, opening offices also in Greece. Offices in Athens and the main islands. It’s a worldwide organisation with a very sophisticated motorcycle rental platform, similar to the one used by the main car rental companies and with the same degree of safety. Small Italian company, based in Civitanova Marche, with a calendar of bike trips that include Greece. At present it is promoting its 10-day tour, from 22 April to 1 May, leaving with your bike from Ancona, Italy. The famous tour operator proposes a ‘quiet trip’ along the roads of Continental Greece and the Peloponnesus, among the world-known archaeological sites and beautiful views of the Mediterranean. Among the alternatives: ROAD (10 days starting from Ancona, Italy) FLASH (8 days arriving in Athens by plane, bike transport from Italy organised by the company included in the price) FREE (8 days: you reach Athens on your bike on your own and then meet up with the group). Another ‘made in Greece’ option. 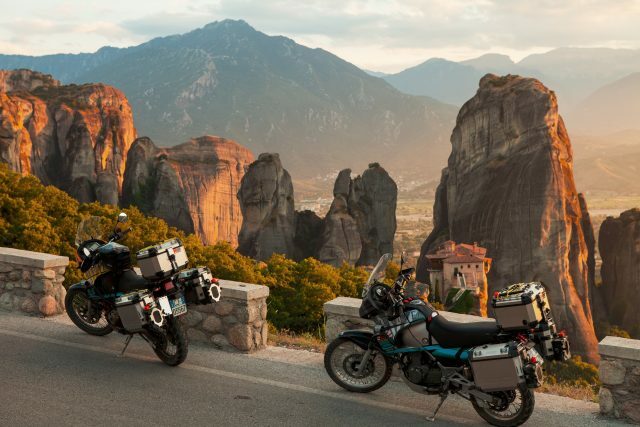 Moto Voyager offers a calendar rich in organised bike tours covering each corner of Greece. Dates are fixed but there is the option of making a custom tour and leaving at your convenience. You can use your own bike or hire one.